Join Half-Step Henry as he takes your piano students on a laugh-out-loud journey; bumping and crashing his way through a lesson on accidentals. With giggles packed into every page, kids will have a blast exploring sharps, flats, and naturals in the C 5-Finger Scale and G 5-Finger Scale. With 12 pages of comic-based instructional exercises, 14 pages of music and an action-packed cut-and-play game, piano students will be begging to turn the pages and find out what kooky trouble Half-Step Henry will get into next. Click here to preview sample pages from The Accidental Adventures Of Half-Step Henry. If you like what you see, click the Buy Now button below to get your copy today. When an accident-prone hedgehog enters the piano studio, a comical adventure is bound to occur! Join Henry T. Hedgehog as he takes your young piano students on a laugh-out-loud journey, bumping and crashing his way through a lesson on accidentals. Sharps, flats, and naturals commonly encountered in both C and G position are explored in this step-by-step format that you can use as a first introduction to accidentals or as a tool to reinforce this important concept. Take away the trepidation many kids experience when playing accidentals by using an unforgettable resource that will have your young piano students reading sharps, flats, and naturals with ease. Featuring engaging illustrations, a step-by-step scaffolding approach, and hilarious dialogue, this book will have your students begging to turn the pages and find out what kooky trouble Henry will get into next. 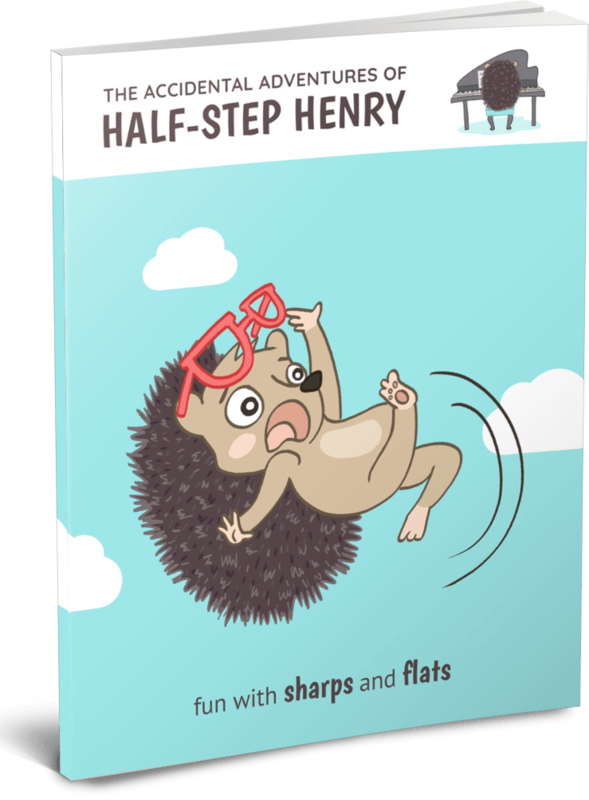 Are your piano students ready to do the Hedgehog Happy Dance with Henry? Take a step back (his quills are sharp!) and enjoy!